I was never a huge fan of Motley Crue. But ‘Too Fast For Love’ is by far their best album in my humble opinion. The Crue got too wrapped up in following trends for my tastes. They went from nasty hard rock maggots living off depravity (‘Too Fast For Love’) to made-up tarts that lived off depravity (‘Theatre of Pain’) within 3 albums. They got too big for their “raisin’” with me. Once ‘Girls, Girls, Girls’ was released, I had long since checked out. But even though I didn’t care for many of their albums after ‘Too Fast For Love’, I still went to see them live. Motley Crue were a great band to see live. They put on a helluva show. I’ve managed to see them on tours for Shout, Theatre, Girls, and the final tour. And when it comes to power drummers, I would consider Tommy Lee one of the greatest that has ever lived. And he would push himself to extremes when it came to live performances when it was time for his drum solos. I have never went to the bathroom or scooted off for a beer during one of Lee’s drum solos. I knew that I was going to see and hear something special each time. ‘Too Fast For Love’ came out ahead of the L.A. bands onslaught in the early 80’s. There was leather, punk attitudes, overt sexuality, and satanic imagery that fueled my desire to check them out. I thought it was all rather tongue-in-cheek, but the satanic imagery was the only thing played up by Motley Crue. First of all, ‘Too Fast…’ is a great power pop album fueled by Nikki Sixx’s love of the rock band Sweet. So don’t be fooled by all the leather, spikey studs, and handcuffs. ‘Too Fast…’ is an album filled with sing-along songs and pretty little pop songs played REAL LOUD with B.C. Rich guitars and Marshall amplifiers. The album opens up with concert staple ‘Live Wire’ that has shades of punk buried behind the riffs. And it has cow bell! But then the album opens up a bit and allows Sixx to pay homage to Sweet with his hunger to move away from Frank Feranna, Jr. (Nikki Sixx’s real name) and the psychological baggage that goes along with him. I believe that’s why “Frankie” died a few different ways in the song “On with the Show”. Sixx was putting Frankie to rest and letting Nikki live out the rest of his life. The album cover is definitely a tribute to ‘Sticky Fingers’ by The Rolling Stones, but don’t let it fool you. The album is all Motley Crue. The only cheese on this release is the poppy goodness disguised as hard rockin’ tunes. For me, this is a fine as Motley Crue got musically. They got bigger and were allocated bigger budgets on the albums that followed. But it didn’t sound like Motley Crue to me. When I first heard their cover of Brownsville Station’s “Smokin’ in the Boys Room”, I nearly had a dry-heave. And even though I covered “Home Sweet Home” in a band, I hated that song. HATED IT. 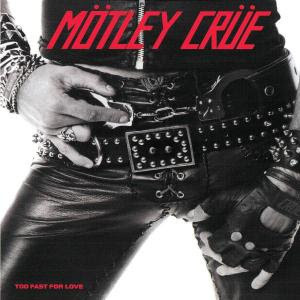 ‘Too Fast…’ is the ONLY Motley Crue album that you need. It has everything they ever were or were going to be. It’s the ugly and crusty scab that covers the debauchery inside. I suggest that you pick that scab and put ‘Too Fast For Love’ into your collection. Play it loud often. Sing along with the songs. Get lost in the TRUE Motley Crue that we only saw for one beautiful album.